COLLECTOR UPDATE: Boundless Warriors has been sold. 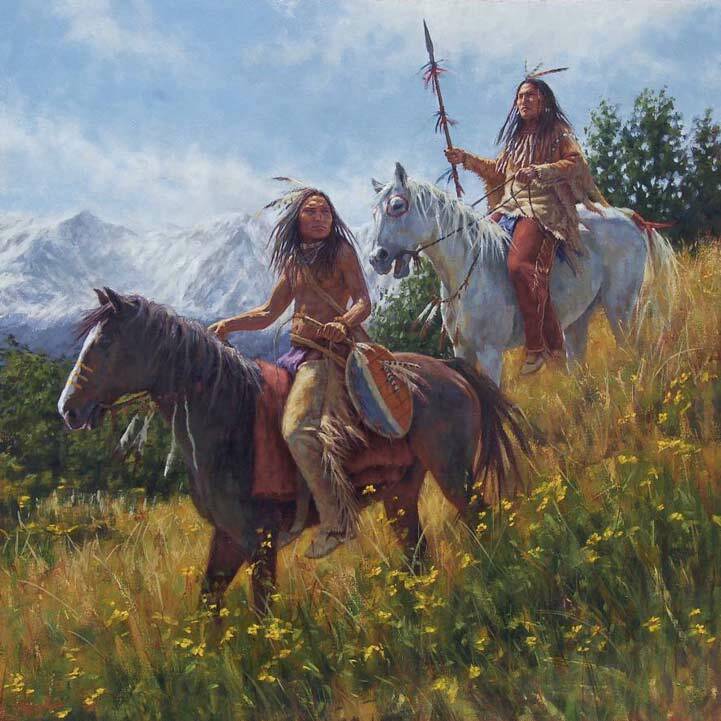 I'm pleased to introduce Boundless Warriors, a painting that depicts two Ute warriors in the high country in springtime. I created this painting after my early April, 2012 research trip. I wanted to capture that fleeting time in early spring, where there is plenty of snow on the mountains and the first wildflowers of the season are blooming. Boundless Warriors is a vibrant scene of young Ute warriors descending from the highlands. The first man rides a horse decorated with coup marks--these would have been to count coup that the horse and warrior shared together. The warrior carries his shield--shields such as this were unique to the owner: each man earned his own guiding symbols and protective medicine during his vision quest ceremony. Shields are an entire field of study in archeology with debate as to the meaning of the symbols. Since shields are such individual expressions, I took liberties with this one by adding blue and orange colorations to represent the earth and the sky, decorating it with eagle and hawk feathers, and adding strips of red trade cloth. The second man wears red leggings and an orange shirt. He rides a horse adorned with red circles painted around his eyes (to give the animal good eyesight). Boundless Warriors was created on the diagonal to give the piece forward movement as the riders come down the grassy slope. 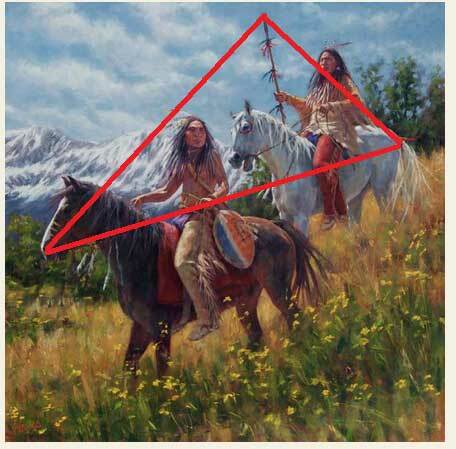 A more subtle - but still important - design component is the triangle formed by the brown horse's nose, the spear, and the tail of the white horse. This shape helps move your eye into and across the scene. In terms of color, notice the how the red circle around the horse's eye makes a sharp focal point by bringing a splash of color to the otherwise cool tones in that part of the painting. Similarly, the second rider's red leggings continue to draw your eye in. This painting was inspired by my early April, 2011 research trip up into the Colorado highlands. There is a specific look to the mountains in the springtime just before the snow melt, and I knew that I had only a brief amount of time to document just the scene I wanted. In addition to the mountains and grassland, I also used images from a local riding stable to capture the horses in motion. You can see the reference images below. 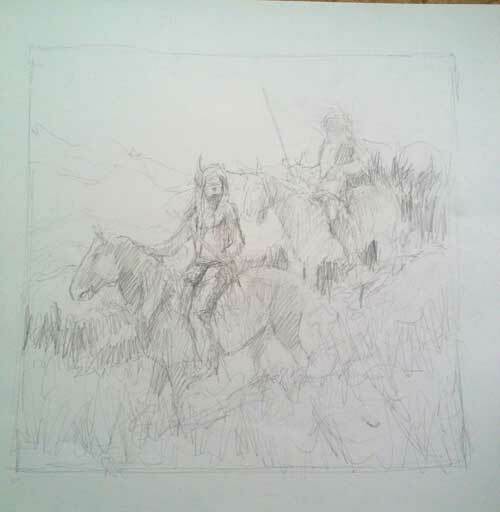 If you are interested in Boundless Warriors, please contact my studio: James Ayers Studios email.